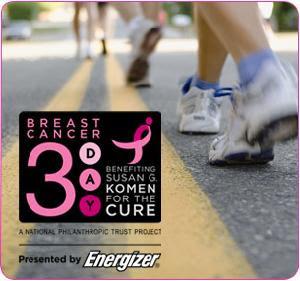 So one of my best friends, Margaret, is going to Washington D.C. in October to walk in the breast cancer 3 day event. She will walk 60 miles in 3 days with thousands of other people in an effort to raise money for the fight against breast cancer. This subject is personally close to my heart as my mother had breast cancer, and I am so thankful to say, is a survivor and past her 10 year mark a couple of years ago. I wish I could do this walk, but I can tell as many people about Margaret and her walk as possible. She has to raise $2300 by the time of the race. HERE is the link to where you can donate. Margaret walks in honor of her mother who did not win her fight against a rare cancer. She will carry in her heart her mother, and all the other people who have been impacted by cancer. Any amount helps and is greatly appreciated! Please let me know if you have any questions. Way to go Margaret! We (my bible study group) are actually thinking of doing this also, since Rachel lost her mother as well to Breast Cancer. It is definitley something we want to support! Way to go Margaret, so cool you are doing this. Way to go Sunday for getting the word out and getting people involved! This is so great! I love that you are helping support margaret!